Tonight on CBS Hawaii Five-0 continues with an all new Friday December 12, season 5 episode 9 called, “Ke Koho Mamao Aku (Longshot)” and we have your weekly recap below. 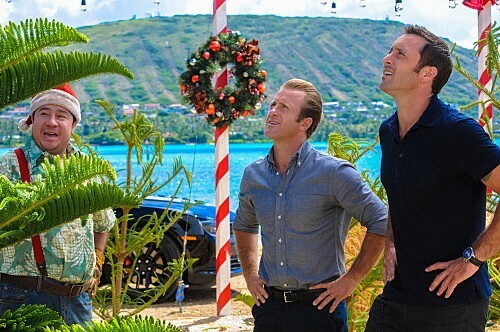 On tonight’s episode, it’s Christmas in Hawaii and Five-0 travels to the Big Island, where Max [Masi Oka] is forced to work with a rival medical examiner after a cowboy is poisoned. On the last episode, while the team investigated a couple’s murder in which their sons are the prime suspects, McGarrett was shocked when Aunt Deb returned to the island with her new fiancé. Did you watch the last episode? If you missed it, we have a full and detailed recap right here for you. A rover vehicle skims across the surface of a volcano and then has a malfunction. A guy in a space suit looking thing walks over to it to check out a problem. They tell him someone is coming and he sees a guy there. He radios back to the command center he was talking to that they’ve got a civilian out there. The man staggers towards him calling for help then collapses. He says the man isn’t breathing and tries to start CPR but it’s difficult because of the thick gloves and visor that make up his protective gear. Danny and Steve are at a Christmas tree lot and Steve says they’ve waited too long and may need to go artificial. Danny refuses and then finds one he likes. The guy says it’s the Cadillac of Christmas trees and says it’s just $750. Danny says that’s robbery then offers him a tiny one. Danny asks the guy if he looks like Charlie Brown to him. Danny says it looks like something that fell off a larger tree. Steve says they can try something else and they go. In the forest preserve, Steve is getting ready to cut down a tree but Danny is nervous since it means they’re breaking the law taking a protected tree. Steve cuts off the chainsaw and Danny says he wants a tree but not like this. Steve says he and Gracie deserve a tree. He says the park won’t miss one and cuts it down. They strap it to the car and head off. Danny tells Steve he can’t believe he made him an accomplice to a crime and Steve says it’s a victimless crime. Danny tells Steve that he’s a scrooge and a ruiner of Christmas and Steve says bah humbug. The phone rings and Steve tells him to get the phone. He doesn’t and Steve answers but says it’s for Danny the malcontent. The head out to the volcano site on Mauna Loa. They make introductions to the locals then go look at the body. They tell him a HI-SEAS guy tried to save him. They don’t know what that is and Max explains it’s Hawaii Space Exploration Analog Simulation. They train there to prepare for space work. They tell them there is no ID on the victim but they’re running prints. Max sees his nemesis there and Lou asks who this is. He tells him the guy’s name is Sanjeet and that they did their residency together. Max says he doesn’t know why he’s there and the Sanjeet says he’s involved in the case like it or not. Sanjeet says he thought it was pulmonary edema. Max looks in the victim’s eyes and says it was poison and he can’t believe Sanjeet missed this. Lou asks them to take the body to the morgue and they can settle their differences there. Sanjeet says it’s on and Max says – like Wrath of Khan. The local comes back and tells them they got no match and they wonder if he came from a local ranch based on his clothing. They are told the closest one is 15 miles away and Lou asks how does a cowboy end up dead on Mars. At the morgue, Max snaps pics while Sanjeet draws fluid from the lungs. They glare at each other openly. Max checks xrays then looks at the photos he took on the big screen. Sanjeet asks why he’s focused on old contusions and Max tells him to let the adults do their work. Danny comes in and asks what’s up between them. Max says it was over a woman. Then he tells them he’s sure the COD was poison but aren’t sure what it is. Sanjeet says he narrowed it down based on lung substances. Max says it’s likely TCVP. Lou asks how the poison got into his body and Sanjeet says it was likely ingested. Danny says it could have been in food or drink. Sanjeet says they’ll no more once they analyze the stomach contents. Max says he already has an idea of who the victim is. He shows them the screen and pulls up a video of a rodeo rider. He says their victim has fractures common with rodeo riding and he also found rosin on the guy’s hands. The guy was a bull rider. They head to the local rodeo where Santa is riding a bucking bull at an event. Kono is there with them and they meet Al, the organizer and Jill, the manager of the riders. They show them the photo and they ID him as Keone. They ask if they know why he might have been up on the volcano. Jill says his day job was delivering hay and there was no reason for him to be up on Mauna Loa. Al says Luke might be someone who wanted to hurt Keone. Jill says he’s another rider and said Keone accused him of cheating by injecting bulls with steroids. Al says Keone was right and Luke’s bull had steroids in it so they fired Luke and he had to give up some of his prize money. Chin tells them that Luke has a record and lives in the Lava Gardens. He sends the address and Lou says he’s getting CSU to Keone’s house to look for the poison. Pua comes in looking for Steve and Danny. He asks if Chin knows where they were this morning. He doesn’t. He says it’s official police business and he can’t tell him. Chin reminds him he’s police but Pua acts like a jerk and leaves without explaining. Danny and Kono roll up to the Lava Gardens and he asks why anyone would want to live out here. Kono says real estate is cheap. They see Luke putting up some equipment and he takes off running when he sees them. They give chase. Kono takes him down then uses his own rope to hog tie him. Danny tells her it’s nice roping and calls her cowgirl. She says she thinks it’s her best time. Danny asks Luke what happened with Keone. Luke says he hasn’t hurt anyone. Danny says he’s the only one with motive and Danny says they know he got him fired. Luke says he ran because he had drugs on him. Kono comes over with vials of drugs she found. Danny says he doesn’t care about those – just the murder. Lou calls Danny and says someone has trashed Keone’s house and gone through it thoroughly. Lou says based on a witness, it looks like it happened after he was poisoned. Lou says it doesn’t look like robbery since valuables were left behind but mentions the memory card from Keone’s camera is gone. Sanjeet comes in gloating telling him that he got the wrong drug. Max says he was just texting Lou to tell him the poison was injected as a liquid. Max says he’s going to be the one that cracks this and Sanjeet says at least he’ll still have Janice. Max yells that he stole her from him. Sanjeet says he painted him as a villain to all their friends and now he’s a pariah. They argue and Sanjeet walks out on him. Lou finds a bottle of juice and sniffs it. He’s checking anything that poison could be in. He finds a small vial of blood in an empty milk carton. Danny and Kono discuss this and she says she’s worried they won’t be home for Christmas if they don’t solve this case quickly. Danny is bummed and says he thinks Gracie is done with Santa and that’s bothering him. Kono says it’s inevitable. He says every Christmas morning, she had this glow when she saw the gifts Santa left her. Kono says it’s not so bad and says now the ruse is over and there’s no more lying about gifts. She says this year he’ll get all the credit for the awesome gifts. She says it’s okay for a girl her age to not believe. He says it’s probably just him being upset over her growing up so fast. Pua pulls up to Danny’s house and looks over the car. He touches his finger to some sap on the roof and then pulls out a CSU kit and takes a sample. He smiles. Steve comes back to 5-0 for an update from Chin. He says it seems like Keone was driving when the poison kicked in and says he also has a lead. He tells him Pua was looking for he and Danny and was acting odd. They call Kono and Danny and Chin says they checked Keone’s phone records and he called a guy in LA – Jeff Harrison – nine times in two days. Harrison flew in from LA and then the next thing you know, Keone is dead. Danny says he remembers that Harrison had a valuable Kentucky Derby horse kidnapped. Chin tells them what hotel Harrison is at and that he’s booked on a flight out today. They head over and see Harrison come staggering out of the hotel. He’s got vomit on his chin and begs for help then collapses. They shove him in the car and race to the hospital. Kono says she doesn’t think he’s going to make it. Danny calls ahead to have them ready for Harrison. They pull up to the ER and the EMTs grab him and they tell him they need to know the poison to save him. Max and Sanjeet are at Harrison’s hotel room looking for the source of the poison. They race around feverishly. Sanjeet sees a bottle under the bed, opens and sniffs it then gives it to Max to sniff. It smells like liquid nicotine. They run it to be sure and agree that it wouldn’t show up on a standard to screen. Max tells him it was a good catch then tells him he’s sorry for letting their friends turn against him. He apologizes and Sanjeet accepts it. They get the confirmation that it’s liquid nicotine and call the hospital. They are able to save Harrison but can’t question him for a couple of hours. Lou says the blood at Keone’s house was horse blood and was drawn a couple of days ago. Danny says to run the blood against the missing horse from the Equestrian Association’s DNA database. Pua shows a woman a book of mugshots and he’s included Steve and Danny in there. The woman points them out and calls them haoles. Lou tells Danny the blood did come from Urban Myth, the missing horse. Kono says Keone must have come across the horse and alerted Harrison and then the person that stole the horse killed them both. Chin says there are three horse stud farms and one is on Keone’s delivery route. It’s owned by Al, the owner of the rodeo that pointed them to Luke. Lou and Danny roll out to pick up Al. They pull up at his ranch with blue lights and sirens blaring. Lou asks a ranch hand where Al is and he says he left an hour ago with a horse trailer. Lou and Kono hop back in the car to try and find him. Chin tries to ping Al’s cell phone but can’t get him. Steve says Al rented a backhoe and had it delivered to another property he owns. Kono says he’s going to kill and bury the horse. We see Al unloading Urban Myth from the horse trailer. He’s already dug a hole for the poor creature. He leads the horse over to the hole and takes aim with his gun but then Lou, Danny and Kono are there and one of them shot him in the arm. Danny comforts the horse while Lou arrests Al. He complains that he’s bleeding but Lou is unsympathetic. Lou tells Al they have him for murder too. The travel mug in Keone’s truck had liquid nicotine and what’s likely his fingerprints on it. They tell him they know he found out Keone recognized the stolen horse and then found out he called Harrison so he killed them both. Al says Keone always talked about how much he loved horse races and says when he saw Keone on his security cameras, he knew he recognized Urban Myth. Al says the horse got a nice life, the owners got a fat insurance payout and everyone had moved on. He says no one cared anymore and Lou says – Keone did. They take Harrison out to see Urban Myth and he tells them that he missed his horse terribly. Urban sees him and comes running over to the gate. He goes inside and the horse runs up to him like a beloved pet. Harrison walks up to greet the horse and snuggles him and lays his head on Urban’s head. You can tell he really cares about the creature. Later, the guys head to the chopper and Lou complains that Danny always gets shotgun. Sanjeet pulls up in a rush and tells them to wait. He comes over to Max and says he wanted to thank him for his help on the case. He tells him his wingman skills are unparalleled. Max says he’s happy to assist. Sanjeet hands him a gift and says – Merry Christmas. Maxis excited and runs over and rips it open. Sanjeet says they belong together and Max shows them it’s a Star Trek figure. Danny asks if they were fighting over a Barbie doll and they correct him that it’s an action figure. Max says the Janice figure would have completed his collection but Sanjeet snaked it from him in an auction. Max offers to give it back but Sanjeet tells him to keep her and says it’s meant to be. Lou tells them this is all touching but they need to go. He thanks Sanjeet and gets on the chopper. Max tells him that he has been and always shall be your friend. He throws up the Vulcan salute and tells him to live long and prosper. Sanjeet throws it up as well. Later, they are all over at Danny’s for a Christmas party. The doorbell rings and it’s Kamekona. The doorbell rings again and it’s Pua. He hands him a citation for the purloined tree. The fine is $1,200 and Pua says he has to confiscate the tree. Danny says it’s Christmas Eve. Pua comes in and sees Gracie then relents and says he can take it back tomorrow. Danny invites him to stay for eggnog and he does. They all gather round and Kamekona starts into Silent Night and the others join in.